Experienced, caring and flexible sitters with 5* reviews. Now taking assignments for 2020! For added reassurance we are more than happy to discuss a sit with you on Facetime and we will answer all e mails. Do we match your criteria? Please contact us with your dates as we are retired we can be flexible. 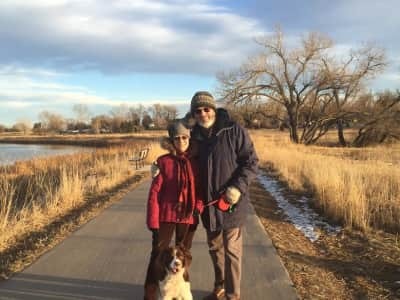 Going to new places, enjoying experiences and adventures is how we spend our retirement and house and pet sitting is included in our plans. Through house sitting we have met really wonderful people, forging lasting friendships we value very much. 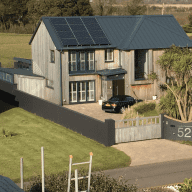 Our life experiences and practical skills will ensure you leave your home in the right hands. We have been homeowners since 1973. We know that you are seeking responsible and caring house sitters, who will respect your property and ensure confidentiality in all aspects. Let us know about your pet's routine. We understand how much attention a loved pet needs and would care for your animals as we have cared for our own. Tasks such as checking for grass seeds in a dog's coat, and making sure your pet has their medication on time, are all part of the care we have given for many animals over the years. 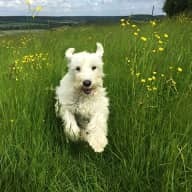 We said goodbye to our much loved Miniature Schnauzer, Maxwell, in January 2019. We know how animals can make a wonderful impact on family life. We have listed information that would give you an insight into our skills and interests, past and present . It is important you feel reassured that we are able to deal with any issue in your home while we are sitting for you. Communication is key and we will send news and photos of your animals while you are away. Or if you prefer, 'no news is good news', that ok.
We hold current passports and clean driving licenses with experience of driving worldwide. We are proud Parents and Grandparents - see our family photo. In June 2017 we gave up our prize winning allotment to enable us to house sit and travel. We love gardening. Ask us to pick plums or mow the grass - no problem . Christine happily retired after 30 years in local Government. A past volunteer costumed tour guide with The National Trust. Member of the WI in Shropshire. A keen Am-Dram member. Albert is very calm and practical. 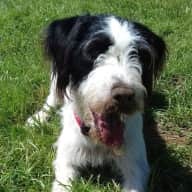 He can administer your pets medication and has completed a Canine emergency first aid course at our local vet practice. Now retired from his past role as Project Manager in Environmental Services, working worldwide. Where to start? 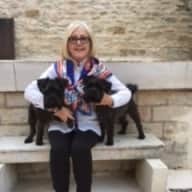 Although Christine and Albert were only looking after our two schnauzers for a few days they were so conscientious in their care and attention that they were able to subdue a persistent barking issue in this short time. So excellent dog skills all round. They were also very enthusiastic in getting out and about in our area getting to the beach (and its various cafes), onto the South Downs and various other venues. There is no doubt that the dogs had a very good time in their company. Above and beyond also included a very thorough tidy up of the garden which was in need of some care and attention. This was completely spontaneous on their part and much appreciated. The house was left immaculate and well ordered which was also great to come home to. We would have no hesitation in recommending them to anyone looking for future dog and house sitting. I am sure they would be equally diligent whatever the animal. Wishing them luck in the future and many more happy sittings! Thank you so much for the 5* reference. It was a pleasure to care for your loving Mini Schnauzers and home. An added bonus was to have so many dog friendly places to visit in the area. The beach cafes were wonderful with dog drinking bowls everywhere! A sunny few days made our sit even more enjoyable. This was our first time, so it is fair to say we were very inexperienced about knowing what to expect. 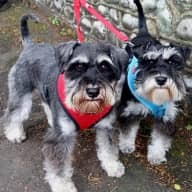 What was great was the fact that Christine and Albert had personal experience of mini Schnauzers, plus, our communications before they arrived, by face time and WhatsApp. I am almost overwhelmed by the very positive experience we have had. 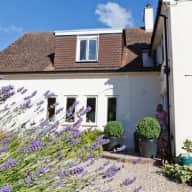 We had one night with Christine and Albert before we left, but they took over the role of carers for Sam and Max as soon as they arrived, which we felt very positive about. They gave us a lift to the station and picked us up when we got back., way above our expectations. The care and trouble they went to was well above what we expected, both keeping up updated and fixing a couple of stubborn loo holders! It was clear our dogs adored them both, as do we. I cant speak more highly of them. Our house was in great order when we got back and Christine made my favourite scones! They were really marvellous. We even had a de-brief from them which was very helpful. We can't thank them enough, their approach and attitude meant that I had a worry free holiday and that is priceless, we hope to welcome them back for our next trip. This was an enjoyable sit in so many ways. The 2 Mini schnauzers Max and Sam were a delight to care for.as they are loveable and easy going. 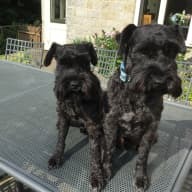 They had many of the Schnauzer characteristics we are familiar with - they loved to be in the garden but had to be encouraged to leave the house in the rain – and it rained most days. 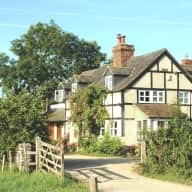 However, the location was stunning, the house was warm and well furnished, our bed comfortable and we fell asleep to the sound of the flowing beck next to the house. The locals readily stopped to say hello and happy to advise on the best dog walks. Ellen and Juris were friendly, generous and hospitable hosts. It was a pleasure to sit for them. We would happily sit again, be it in the UK or further afield. Thank you for the complimentary review Ellen and Juris. I have just returned to two very happy healthy dogs and an immaculate house. Christine and Albert were great. I got regular updates and photos. I am really hoping they will sit again. I can highly recommend them. My husband and I have known Christine and Albert for about twelve years now and I can honestly say that they are both the most reliable, trustworthy, diligent and kind couple we are privileged to call friends. They house and dog sat for us over a long weekend recently. Our old Labrador dog, Monty has a terminal illness and had also lost his lifetime mate, a little Jack Russell cross called Liquorice. The kindness and compassion they showed towards Monty was as if he were their own dog. They brought their dog, Max to stay and he seemed to have a sense that Monty needed gentle company. Not only did they treat our home with respect but also collected out cooking apples and a delicious apple crumble was waiting for us when we returned home. Our home and pet could not have been in safer hands and I would recommend their care without reservation. I have known Christine for approximately 15 years and value her as a true friend. Christine is a very honest and genuine person who is also very caring and supportive. I would trust her with my most intimate secrets as she has the ability to always maintain confidentiality. I would have no hesitation in leaving her in my home and have had her and her husband Albert stay in my holiday home. 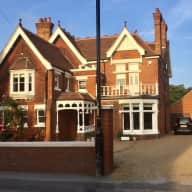 Not only do I not worry about my processions,as I know they are both very careful about other people's property and belongings but they are very clean and tidy people and my home is left cleaner than it was when they came. As pet owners they are extremely attentive , caring and loving. They keep very high pet standards and make sure their dog is very cared for and kept fit and healthy. As with my home I would have no doubts about leaving my pet in their care. I would recommend Christine and her husband Albert as trusted housekeepers and pet sitters.